Volume 20, Number 4, March 1999 © 1999 Human Sciences Press, Inc.
That oil production will peak and then decline is not debatable. 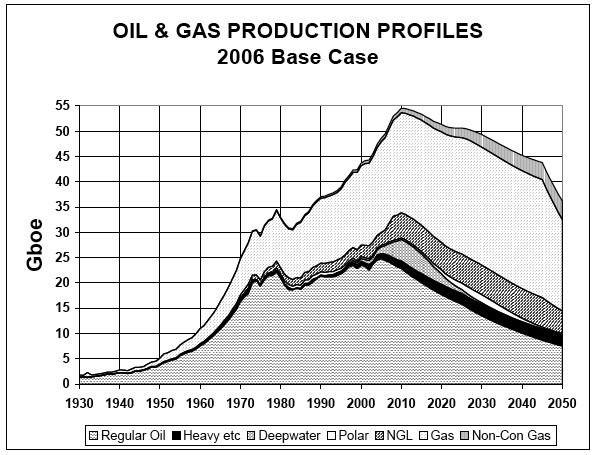 If the more optimistic are right, and the peak date is a little further away than most geologists now predict, this would simply exacerbate the problems, for it means that the population at the turning point of oil production will be even larger than it would be at an earlier date, and it will be then more difficult to make the adjustment toward life without oil. "Contrary to the theory, oil production shows no signs of a peak... Oil is a finite resource, but because it is so incredibly large, a peak will not occur this year, next year, or for decades to come"
For those who understand the overwhelming importance of fossil fuel depletion, the signal event of 2008 was without doubt the oil price spike that sent the cost of a barrel of crude rocketing to $147. Knock-on effects were as anticipated: the airline industry contracted, the auto industry went on life support, food prices jolted upward, and the overall economy went into reverse (more on that below). Due to all of these things, the demand for oil subsequently peaked and began to slide, which in turn caused the price to plummet, with no end currently in sight. I am among several commentators who have gone on record as saying that July 2008 will turn out to have been the all-time record month for world petroleum production. With the price so high (in July), all producers were pumping flat out. 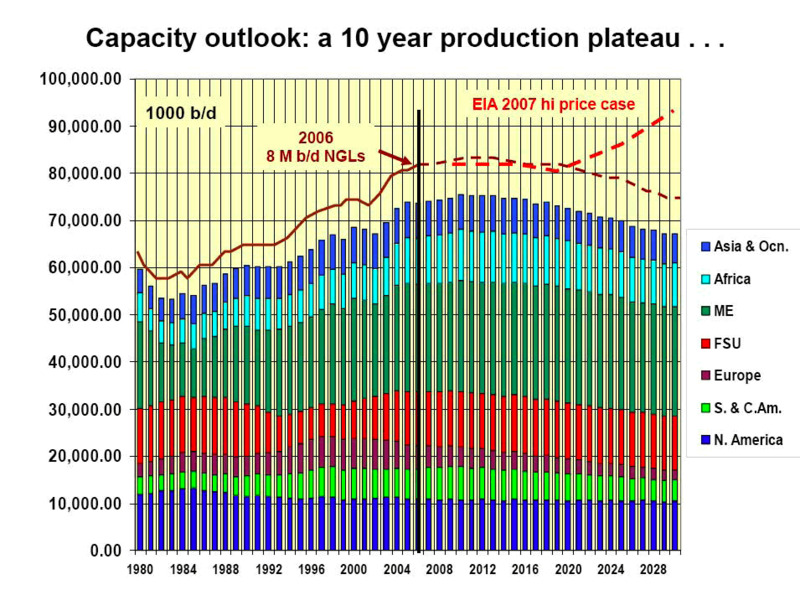 And now, with the price so low, there is no incentive to make the required enormous investments in future productive capacity, so that when demand picks up again (and it may be a few years before that happens), new additions to supply will not be sufficient to overcome the capacity erosion that will have accumulated in the interim due to depletion and decline in existing oilfields. Say goodbye to Peak Oil: it's history now. What is the timing of Peak Oil? The only “debate” about peak oil is the exact timing -- from a long term historical perspective, it does not matter whose predictions about the exact year of peak and decline ultimately prove to be correct. SPENDING OUR GREAT INHERITANCE — THEN WHAT? ... Now that we’re close to having consumed half the world’s oil, how soon will we reach peak production? This question has been the subject of discussion for many years, with various forecasts of the peak of world or regional oil production offered. Many have already proved wrong. One estimate, however, was correct. In 1956, as Campbell and Laherrere point out, Shell Oil geologist M. King Hubbert predicted that the United States would peak in oil production around 1970. His forecast was widely ignored or scoffed at by the general public, and by many geologists, but Hubbert was right on the mark. When the future of oil is discussed, the common question asked is “How long will oil last?” This is the wrong question. Insignificant amounts of oil will probably be produced in the year 2100 and perhaps beyond. The critical date is when the peak of oil production is reached and the world’s demands can no longer be supplied. From then on, there will be less and less oil to divide, in contrast to the current happy situation where we have more and more to divide. It is probable that the decline of world oil production will affect more people in more ways than any other event in human history. Because various estimates of the date of world oil peak production have been wrong, it is sometimes assumed that forecasts such as Hubbert’s will be wrong. This may be true, but the question is “How wrong?” With many more production-based data points now available than in the past, production curves are becoming well established. The peak of world oil discoveries passed in the 1960s, so the downward trend of that curve has already been established. Simply continue the classic bell curve and you’ll find a representation of the total amount of available oil. The theoretical graph of the production life of a finite resource indicates approximately 30 years from peak of discovery to peak production. Applying these curves to oil, with new technology such as horizontal drilling, 3-D seismic, and improved secondary recovery methods, we can predict that peak production (after the world oil discovery peak in the mid-1960s) will occur in about 40 to 45 years. But Campbell and Laherrere state: “Barring a global recession, it seems most likely that world production of conventional oil will peak during the first decade of the 21st century.” Their estimate agrees with what many others, myself included, have said. 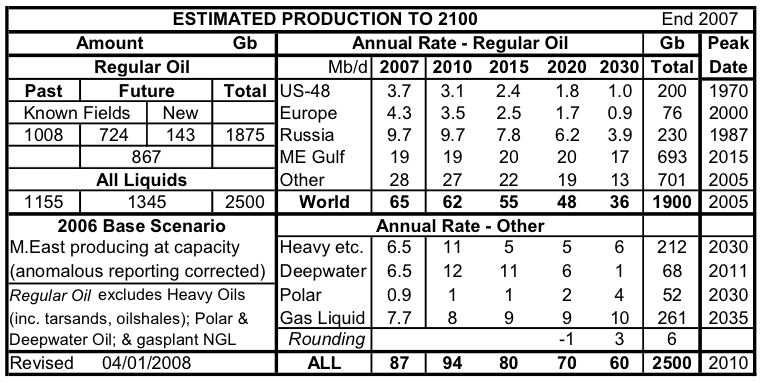 In his article, “Crude Oil and Alternative Energy Production Forecasts for the Twenty-first Century: The End of the Petroleum Era,” J.C. Edwards sets the peak at 2020 — a more optimistic forecast than others, but still clearly within sight. As an interesting sidelight to the time of peak, Chevron Corporation in 1997 announced the discovery of an oil field offshore of Angola. They stated it could hold as much as a billion barrels, and appeared to be the largest find the company had made in the last 10 years. A billion-barrel oil field is indeed a prize. But in “An Analysis of U.S. and World Oil Production Patterns Using Hubbert Curves,” a paper recently submitted for publication, Albert A. Bartlett calculates that adding a billion barrels to the world oil supply would move the peak of world oil production back just 5.5 days! ASPO's latest estimate is the world "peaked" for conventional oil in 2005, and the peak for all oil will be in 2010. The all oil figure includes unconventional oil such as heavy oil (tarsand / oil shale), polar, deep water, and natural gas liquids. The world is now on the Petroleum Plateau, which will drop off sometime after 2010. (Podcast) A secretive gathering some of the world’s biggest oil companies has concluded the industry will discover far less oil than officially forecast, according to an executive who attended the event, meaning global oil production may peak much sooner than many expect. The Hedberg Research Conference on Understanding World Oil Resources was held by the American Association of Petroleum Geologists in Colorado Springs last November to try to reconcile widely divergent estimates of likely future reserves additions. In an interview with Lastoilshock.com, oil executive Ray Leonard said the majority view was that future oil discovery would amount to some 250 billion barrels, rather than the 650 billion barrels suggested by the United States Geological Survey. Published on 1 Feb 2007 by Bloomberg. Archived on 1 Feb 2007. Q: Tell me how you draw your conclusion that at this point we've hit Peak Oil. A: If you look at the numbers and you follow what's going on starting with Mexico's giant Cantarell field which is now in a very serious state of decline and then you look at the North Sea and you see just the UK and Norway, it's pretty obvious to me that those three areas alone could actually decline by between 800,000 and 1 million barrels a day in 2007. That pretty well wipes out almost all the production gains coming onstream and in implicit in that it assumes that everyone else is flat. So I think basically too many of our oil fields are too old. Too many now are in decline. The Middle East is basically out of capacity. they're some projects that are being worked upon, but most don't hit the market until 2008, 2009 and we're running out of time. ... I am firmly of the belief that over the course of the next year or two, this issue of peak oil will replace global warming as an issue that we're all worrying, debating and talking about. "In July 2006, the world's oil rigs pumped out crude at a rate of nearly 85.5 million bbl. a day. They haven't come close since, even as prices have risen from $75 to $98 per bbl. Which raises a question of potentially epochal significance: Is it all downhill from here? Now here is a fact - for almost 21 months we have been producing less oil than the May 2005 peak figure. Yet prices have not skyrocketed. This is despite a growing US economy, a growing Chinese economy, a growing Indian economy, a growing Japanese economy, and a very slowly growing EU economy. This 21 months of roughly flat production is similar to what post-peak would look like to the markets. Why haven't prices exploded since May 2005? I don't have data about what future prices will do but the current situation certainly argues that the assumption of skyrocketing prices needs some sort of model to justify it since the recent market history actually argues against it. In fact, what we have seen is the poor of the world dropping out of the oil market entirely, leaving more for the growing economies. I am not at all certain that skyrocketing prices will occur post-peak immediately. Rather, I think prices will skyrocket and even large scale wars will ensue once there are no more poor nations to be squeezed off stage. When will that occur? I have no idea. But if we are post-peak today, we could meander along for years in slowly increasing prices as more and more of the world "goes Zimbabwe" (as Bob likes to phrase it) until one of the major players is facing being squeezed off stage. Then and only then will we see the huge bidding wars that I believe will turn into physical wars. For now the bidding wars are against the world's poor and they lose out with just a few dollars change in price. So while a price of $70 per barrel would annoy us, it would drive tens of millions more third world people out of the age of petroleum. The 2006 price spike is widely perceived as being caused by an excess of speculation. Hedge fund managers read forecasts of a bang-up hurricane season in the offing and that, coupled with greater-than-normal turmoil in the Middle East, led them to speculate wildly in oil futures. When the Middle East turmoil subsided a bit and the hurricanes failed to appear as advertised, oil prices collapsed. All this of course is perfectly true, but is only part of the story. Largely unnoticed was the underlying supply and demand situation, and a new factor: oil affordability. The final returns won’t be in for several months, but it is beginning to look as if world oil production stayed about the same or increased insignificantly during 2006. Consumption in China, Russia, and the Gulf oil states increased while staying about the same in the industrialized states of North America, Europe and Asia. With flat production and steady or increasing consumption in those countries that publish detailed reports, something had to give or else we would be seeing considerably higher oil prices. The give came in the underdeveloped world where $20 or $30 oil was affordable for generating electricity, running pumps, and for cooking, but $60 or $70 per barrel oil was not. Again, the returns are not in yet, but anecdotal evidence is accumulating that many parts of Africa, Central America, and Asia are starting to shut down. For these peoples, the oil age, such as it was, is already over. "I have been looking at virtually the same facts that Mike points to, and I must say that the scenario he describes is not unrealistic given the factors in play. The economic situation for the US is truly dire. The house of cards may hold up for months, even 2-3 years. But on the other hand, we could very well be seeing the beginning of the great unraveling, to use Krugman's phrase. And given the nature of the current US administration, economic hardship is likely to lead to war as their only practical means of deflecting blame. I can think of milder outcomes over the short term than the one Mike describes, but to tell you the truth I myself am plenty worried right now. I have never seen this dangerous a confluence of factors in my lifetime." Published on 4 Dec 2007 by ASPO-USA. Archived on 4 Dec 2007. "The four Transition periods (T1, T2, T3, and T4) will roughly span the 2006-2020 era. Each Transition [will] cover, on average, three to four years. The major palpable difference between the four Ts is their respective gradient of oil output decline -- very small for T1, perceptible for T2, remarkable in T3, and rather steep for T4. In fact, this gradation in decline is a genuine blessing for those having to cope and adapt. "It should be borne in mind that these four Ts are only an overall theoretical structure for future global oil output. The structure is thus so orderly because [it is] predicted with 'Pre-Peak' methods, 'Pre-Peak' assumptions, and [a] 'Pre-Peak' set of rules. "The problem is that we now are in 'Post-Peak' mode, and that none of [the] above applies anymore. "The fact of being in 'Post-Peak' will bring about explosive disruptions we know little about, and which are extremely difficult to foresee. And the shock waves from these explosions rippling throughout the financial and industrial infrastructure could have myriad unintended consequences for which we have no precedent and little experience. "So the only Transition we can see rather clearly (or rather, we hope to be able to comprehend) is T1. It is clear that T1 will witness the tilting of the 'Oil Demand' and 'Oil Supply' scales -- with the former dominant at the onset and the latter commanding toward the close (say, by 2009 or 2010). Beyond economic collapse followed by civil unrest, it is hard to say what will happen as energy production declines..... It is nearly impossible to say how the elite will play this out. It is to be hoped that we won't be left in a totalitarian world where none of us is even allowed the freedom to seek our own sustainable balance. It is also to be hoped that human society does not break down entirely, leaving some small communities attempting to survive while surrounded by predators.